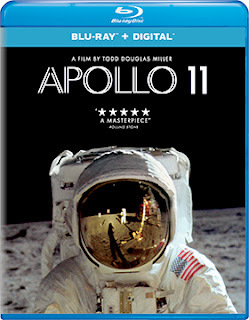 Universal Pictures Home Entertainment will be bringing both DVD and Blu-ray editions of documentary filmmaker Todd Douglas Miller’s Apollo 11 to the home entertainment arena on May 14. The ARR works out to 74 days and theatrical box office receipts currently stand at $8.1 million … a very impressive number when you take into account that film was exhibited on less than 600 screens and continues to generate revenues based almost solely on word of mouth. There have been plenty of documentaries — and movies — on the subject of the Neil Armstrong, Buzz Aldrin and Michael Collins’ voyage to the moon aboard Apollo 11 and the subsequent lunar landing on July 21, 1969. Miller takes a different approach here, he presents the “moon trip” in real time, synching up 11,000 hours worth of audio recorded at the time with never-before-seen 65mm footage that is being seen for the first time in his film. It is, in every sense of the word, a trip; a voyage … a ride to the moon and back.